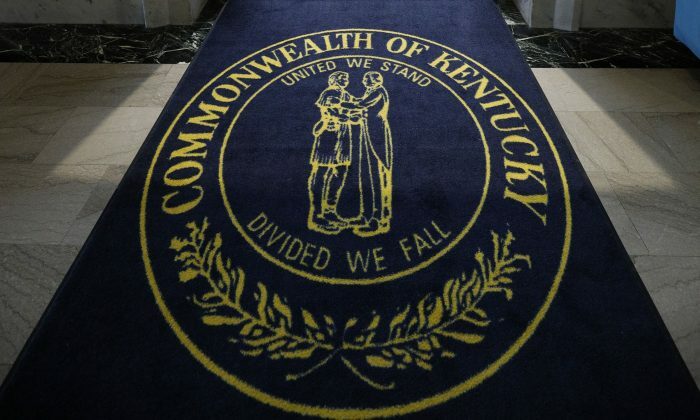 The crime is deemed a Class D felony, which corresponds with a punishment ranging from one to five years in state prison, according to Kenton County Prosecutor Rob Sanders, who holds jurisdiction over Covington. Such a threat “does not need to identify a specific person or … school in order for a violation of this section to occur,” the law states. The Covington students faced a tsunami of violent rhetoric after major media misleadingly reported on their Jan. 18 encounter with Native American activists. A group of the students was waiting for their bus near the Lincoln Memorial after the March for Life in Washington, when they were approached by several Native American activists led by 64-year-old Nathan Phillips. The encounter was extensively covered by media using short video clips that made it appear as though the students were chanting and cheering in mockery of Phillips, while some media claimed that the students—some of whom were wearing President Donald Trump’s red “Make America Great Again” hats—were chanting “Build the wall,” which was later proven to be false. Based on longer videos from the scene, the students had started dancing, cheering, and chanting their school chant to drown out offensive remarks being hurled at them by a small group of Black Hebrew Israelites nearby. 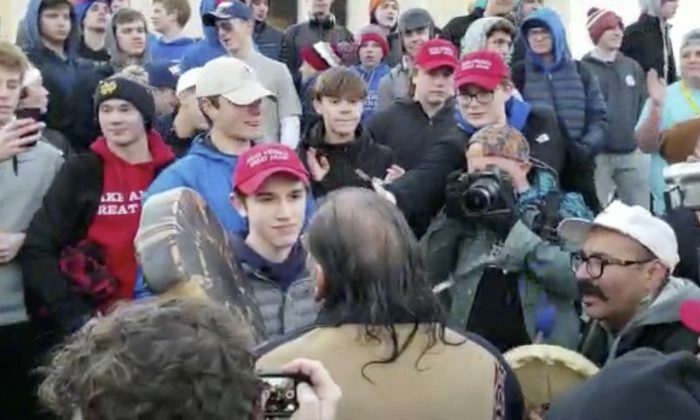 Phillips told media outlets that the students had harassed him, but it was he who approached them, inserted himself into their crowd, and, for several minutes, banged his drum within inches of the face of one student, Nick Sandmann, who responded by standing silently, smiling. The initial coverage whipped up a frenzy of scorn for the students, especially Sandmann, on social media. Some called for the release of the students’ personal information and their expulsion from school. Some called for violence and even offered rewards, perhaps in jest, to people willing to inflict it. Some made statements wishing death upon the students. Many have since deleted their comments. The Diocese of Covington evacuated its offices on Jan. 23 over several suspicious packages that were delivered to its offices. The packages weren’t dangerous, Fox 19 reported. “The terrorism against all thing Covington and Catholic must stop!” responded Sanders in a Jan. 23 tweet. He had over a dozen threats associated with “a credible person and their intention to do the school or its students harm,” the Cincinnati channel reported. “The detective that works in my office has already been busy issuing grand jury subpoenas and composing search warrants for detectives in other agencies,” Sanders said the same night on Fox News’ Ingraham Angle. Todd McMurtry, one of the Sandmann family’s lawyers, predicted that people will end up behind bars for their comments. Sanders and his office didn’t respond to requests for comment. Working with aggressive libel lawyer L. Lin Wood, Sanders leads an action against people who spread the inaccurate and misleading information about Sandmann. The lawyers sent letters to 54 people and companies, asking them to preserve evidence for a potential defamation lawsuit. Included on the list are The New York Times, CNN, HBO, late night host Bill Maher, Rep. Ilhan Omar (D-Minn.), and Sen. Elizabeth Warren (D-Mass.). Another lawyer, Robert Barnes, is also working on a libel action on behalf of some of the students’ families. In a Feb. 3 tweet, Barnes laid out an offer to several people who targeted his clients with potentially libelous statements. “The settlement offer to the offending parties is simple: pin a tweet apologizing or delete your account. Otherwise, face suit,” he said, listing seven people, including Warren, Rep. Deb Haaland (D-N.M.), and New York Times White House correspondent Maggie Haberman.